In April, my family attended the Volunteer Spirit Awards for the second consecutive year. The next day, we helped one of the honorees, Deborah Blatt of the Sharing Shelf. We volunteered at her Girltopia event and hope to do it again this year. The summer was jammed packed from visiting West Point Academy with Colonel Westmoreland and taking a thrilling boat ride with her and some “Blue and Gold Star” Military Families to going to Boston and seeing the Memorial for those who sacrificed their lives in Afghanistan and Iraq. I also made a special horse friend named Phil. He started out at our stable as a retired racehorse who was abandoned and malnourished. He needed a correction to a surgery that was performed incorrectly earlier. He has since made quite a recovery and I ride him now. During the fall months, I won the NY Knicks Sweetwater Clifton City Spirit Award for the month of November. It was a pleasure to meet Mr. John Starks, who presented this award to me. The event took place at Madison Square Garden at center court. This was a once in a lifetime experience. I also walked in the USO 9/11 Remembrance Walk for the second year as well. We will soon post pictures of us marching in the Thanksgiving Day Parade with our new banners. Here is a picture of my grandma at her church. 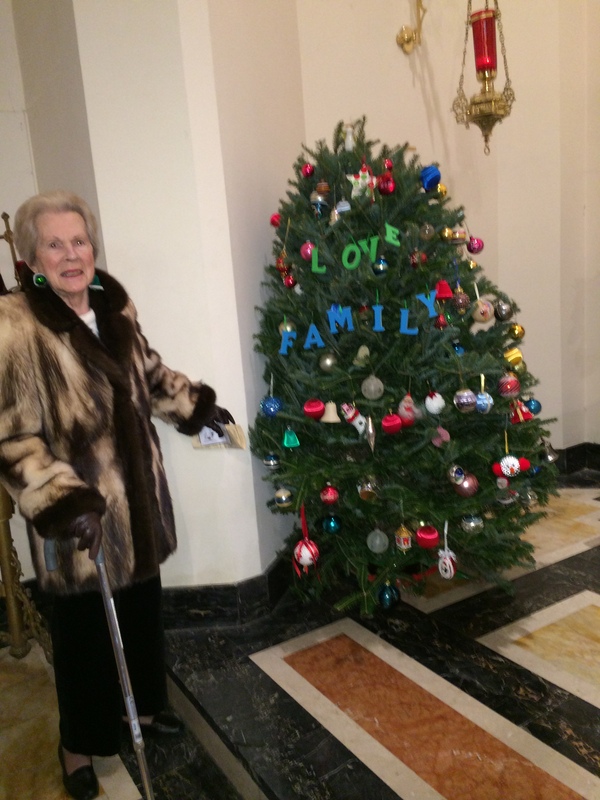 We surprised her with a Christmas tree dedicated to her. She’s THAT special! In the middle of the tree, you will see the words, “Love Family.” Remember that we are privileged. Many times, the Military Families are not together during the holiday season. As I look forward to another great year for Stars for Cars, and you look forward to whatever you have planned for 2014, please remember to LOVE the Blue and Gold Star Military Families, and treat them as an extended part of YOUR FAMILY. P.S. Don’t forget that January 20, 2014 is Dr. Martin Luther King, Jr. Day of Service. Let me know what you did to volunteer.